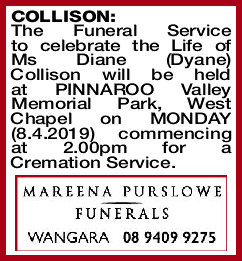 The Funeral Service to celebrate the Life of Ms Diane (Dyane) Collison will be held at PINNAROO Valley Memorial Park, West Chapel on MONDAY (8.4.2019) commencing at 2.00pm for a Cremation Service. Passed away peacefully Thursday morning. Loving mother of David and Michael. Loving daughter of Elsie. Sister to Barry, Wayne, Trisha and Paul. 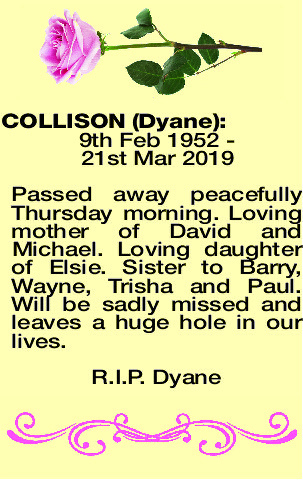 Will be sadly missed and leaves a huge hole in our lives. 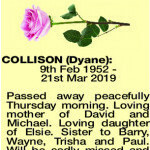 DYANE CAROL Sadly and Suddenly Dyane Carol Collison passed on 21st March 2019 at the age of 68. 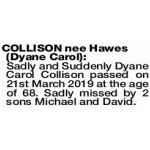 Sadly missed by 2 sons Michael and David. 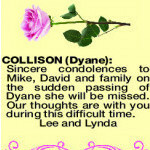 COLLISON DYANE Sincere condolences to Mike, David and family on the sudden passing of Dyane she will be missed. 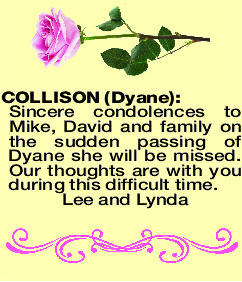 Our thoughts are with you during this difficult time.